London - As he left Olympic Stadium, Oscar Pistorius stopped for a moment and looked back. The double-amputee runner turned to take in the crowd of 80,000 and reflect on his victory in a four-year fight to compete at the London Games against the world's best able-bodied athletes. In a few weeks, the South African will be back at the same stadium on his carbon-fiber blades for the Paralympics. He won't be a sideshow. He'll be the main attraction. Pistorius is the defending champion in the 100, 200 and 400 meters - and he'll be expected to win four gold medals this time. He also will be on South Africa's 4x100 relay team. That's soon to come. He also has "the challenge," as he calls it, of defending his 100-meter title. It is going to be a big challenge, too, because Pistorius probably faces the biggest threat yet to his dominance of disabled running when he lines up for the marquee race. Since the 2008 Paralympics in Beijing, Pistorius has become a 400 specialist in his attempt to compete at the able-bodied Olympics. He also shed about 25 pounds (12 kilograms) to suit the longer distance. A third challenger and another single amputee is South African teammate Arnu Fourie. He also has run impressive times and beat Pistorius over 100 meters back home in March. Bans, court cases, battles to qualify - and, most recently, a crash by a teammate in the 4x400 relay semifinals this week that almost ended Oscar's Olympics early. 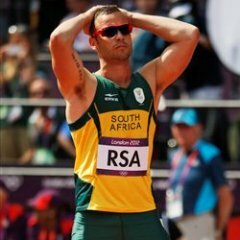 "Next year we've got the world championships in Moscow," said Pistorius, who already has a silver medal with South Africa in the 4x400 relay from last year's worlds. "Looking forward to that as well."